If you have any windows that are reachable for him, consider childproofing locks and do not place nearby any furniture he could climb onto. If your windows have blinds with cords, attach them to floor mounts that hold them firm, wrap them around wall brackets, cut them or tie them to keep them out of reach. Pay close attention to plastic bags: avoid leaving them lying around the house or using them to put away clothes or toys. Dry-cleaning bags can also be dangerous, so knot them before you throw them away so that it’s impossible for your child to crawl into them. For some reason babies seem to always head for the stairs as soon as they learn how to crawl. If you have stairs carpet them if possible. Be sure the carpet is firmly tacked down at the edges. 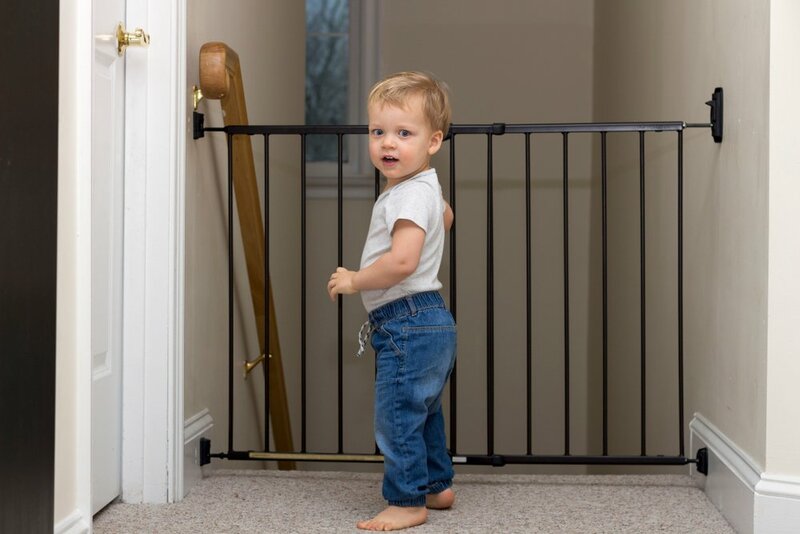 Install safety gates at the top and bottom of the stairs. Gates that can be screwed into the wall offer the best protection. Avoid pressure or tension gates and accordion style ones; they can be pushed out of place and can easily trap an arm or neck. If you have hardwood floors, don’t let your child explore around in socks since he can slip when trying to pull himself up. Once he gets going, he’ll want to be crawling around all the floors, so make sure to always check for any small objects your child might swallow. Some houseplants may be harmful too, so try to avoid or keep them out of reach. Alcohol and unprescribed medicines can be very dangerous for your little one; keep all alcoholic beverages and medicines in a locked cabinet and remember to empty any unfinished drinks immediately. Any supplements, hygiene, and cleaning products within your child’s reach should also be secured with a childproof lock. If you want to keep a room altogether out of his reach (like the pantry or garage), use doorknob locks. Through your loving dedication and care, you are making your baby’s environment safe, supporting his growing skills and development.